Document Verification(DV) as per the following schedule. This is the Second and final call to absentee candidates for appearing in Document Verification(DV), failing which their candidature will be rejected without further correspondence. There is No further chance will be given for DV(document verification) for any reason whatsoever. How to Download e-Call Letter for NTPC(G) Posts? User Id means your Registration Number and User Password is your Date of Birth as you entered at the time application stage. After enter details click on Login button. After Login you will get your Normalized Marks, Cutoff Marks, and e-Call Letter and then Download your e-Call Letter for Document Verification NTPC(G) against CEN.03/2015. 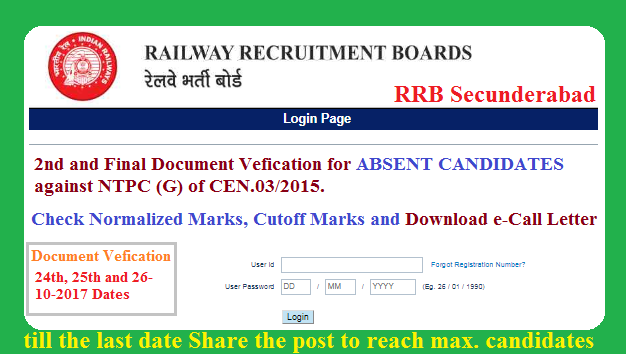 Where is the Venue of RRB Secunderabad NTPC(G) Posts?